A seat was left empty on stage when state Senate candidate Marlene O’Toole did not appear at the Villages Tea Party debate Monday evening at Savannah Center. David Gee and Dennis Baxley flank an empty seat designated for Marlene O’Toole. A chair and card with O’Toole’s name on it were placed between State Senate District 12 candidates David Gee and Dennis Baxley who were both present at the debate. 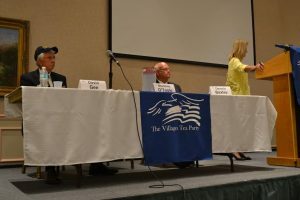 Tea Party president Aileen Milton shared how the event came to be, informing the audience that all the candidates agreed to attend the debate before it was even publicly announced. 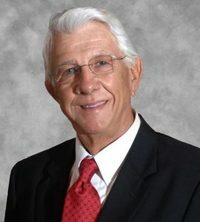 Milton also stated that O’Toole even “told her what kind of format she wanted,” but suddenly withdrew from the debate during a recent event at the Republican Headquarters grand opening. “She was invited, don’t believe she wasn’t,” Milton asserted as she explained that O’Toole was supposedly telling people she was not invited to the event. Candidates for Congress Justin Grabelle and Daniel Webster were there for the debate. Former U.S. Senate Secratary for the Majority Elizabeth Chryst moderated the event and asked the candidates questions related to seven topics: immigration, tax reform, health care laws, veteran affairs, trade deals, Second Amendment rights, and education. All the candidates on stage answered general questions, while some questions, such as ones that dealt with trade deals, were tailored to federal and state interests. Discussing border security, the candidates were on board with stopping the flow of illegal immigrants into the country, but had different ways of tackling the issue. 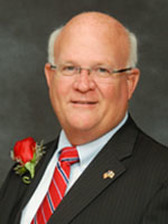 While Grabelle and Gee proposed ridding the country of sanctuary cities and counties, Baxley claimed he did not believe in sanctuary havens. On the topic of education, the question posed was why have we let our higher educations be taken over by the liberal agenda. 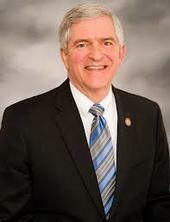 Gee took the opportunity to criticize O’Toole by stating, “let’s start with Mrs. O’Toole please,” and continued explaining how government overreach, through programs such as Common Core, have marred the education system. The rest of the candidates agreed that education should return to the states and community. Every candidate agreed on fair tax, repealing and replacing Obamacare, and improving the treatment for veterans, but they also gave their own versions of solutions to address each issue. There were heated moments among the candidates during the rebuttals in an attempt to gain support and votes from the audience. 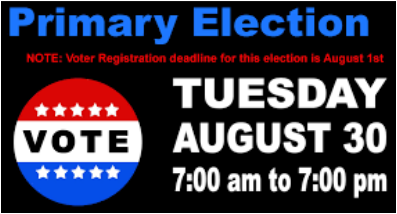 All the candidates will face off in their respective races in the Aug. 30 primaries. Elizabeth is the first woman to be elected by the United States Senate to serve as the Secretary for the Majority for the. GOP. Elizabeth uses her 26 yr Senate career to help non-profit and for- profit companies to navigate Congress for client advocacy in her capacity as Principal @ Congressional Global Strategies. 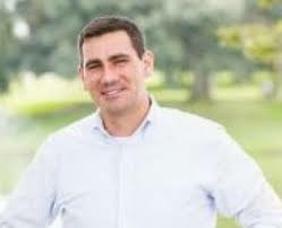 As owner of GradeGov.com, E works daily to avail the site to more and more Americans as a way to bridge the ever growing divide between the electorate and Members of Congress. This dysfunction is dangerous for our great Republic. GradeGov's tag line says it all...Remember they work for you...remind them! GradeGov.com launched GradeGov states in July, 2013. This new franchise idea allows you to own a GradeGov site for your home state where you can set up a site to grade your Governor and state pols. Check it out on the GradeGov.com homepage under the franchise link. You can own your very own GradeGov site today! The shows are archived on GradeGov.com. Click the radio/press link and choose the show you wish to listen to...easy on the ears and plain for the brain! Andrea will be broadcasting her radio show "LIVE"
​Andrea Shea King is the host of a long running talk radio program. Her background includes work as a television news anchor/reporter, newspaper columnist, magazine editor, NASA public affairs specialist, and public speaker. An alum of Emerson College, Boston, with a BS in Mass Media/Broadcast Journalism. Candidate will receive 8 tickets for their personal use. if necessary - Each Candidate will be given 1 minute to answer question 30 second rebutal. ​ candidates has answered the question. # of questions asked based on available time. 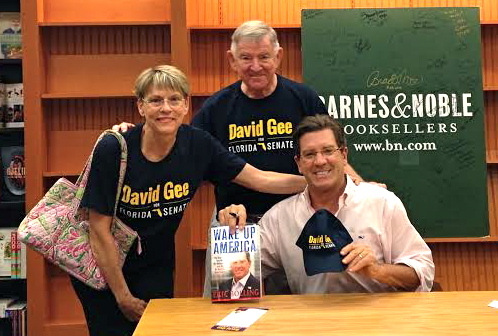 Villagers Beverly Johnson and Jim Belle volunteers for the David Gee Candidate For FL State Senate District 12 with Eric Bolling.